I cannot quite be sure how long it will take to process all approximately five hours of collaborations, legendary sets, and diamond-plated songs, but I goddam well saw and felt everything with the sort of rapt focus that made the hours seem more like minutes. This was all it threatened to potentially be. A special night, one for the ages that turned up not just a fantastic collection of performances but also allowed many on both sides of the stage a chance to properly grieve the tragic, senseless passing of Chris Cornell and celebrate his enormous life and talent. The evening had been conceived and set up by Cornell’s wife, Vicky, as a two-fold event. Firstly, it would honor the legacy her late husband left behind, and secondly, it would benefit two charities the Cornell family were very close to: the Chris and Vicky Cornell Foundation which supports a range of charities serving vulnerable children facing homelessness, poverty, abuse, and neglect worldwide, along with the Epidermolysis Bullosa Medical Research Foundation which is dedicated to finding a cure for EB, a group of painful, genetic skin diseases and was a very personal cause to the Cornells. The night also offered artists and fans the opportunity to pay (and play!) homage to a man whose musical legacy stretched across many ranges, the unifier being Cornell’s unparalleled voice. Who could’ve guessed that energy would take over and elevate proceedings to such a potent and powerful place? I am not sure how many people in the audience were fully aware of the Melvins, but those who were knew exactly why they were chosen to kick-off proceedings. If the Seattle scene had a big, fat, unrepentant Grandaddy slobbing in a double-wide rocking chair and spitting tobacco juice into an old coffee can, that Grandaddy is the Melvins. Melvins are (quite simply) “buzzy buzzsaw, riff raffy riffing of the biggest, fuzziest proportions.” These qualities, combined with a delicious sonic irreverence that oozes Sabbath with a thick smear of crisp crankiness, make them special and properly unique. They sling riffs at you like hammers, their 15 minutes sounded extremely feral and wonderfully unwashed. Embracing the sounds of underground Seattle heroes Malfunkshun and Green River, as well as dropping in their own “The Kicking Machine” and “Honey Bucket,” they wound up with a resoundingly thick and crusty version of Soundgarden’s classic “Spoonman”! The backstage corridors heaved and grunted with friends, acquaintances, and peers who, due to the small space available, found themselves mixing and mingling like it was 1989 all over again. With no big rooms to hide in, it was actually a great thing in the sociability stakes, helping the evening’s vibe become even friendlier. In many ways Grohl incorporates all of Seattle’s finest in his larger than life, yet grebo-soaked, persona, and it was cool to see sticksman/all round rock star Taylor Hawkins with a young Matt Cameron kick skin. Deeeeeep cut “Earache My Eye” was gleefully Grohl-ied before the stuppy-storty chop of “Girl U Want” kept the crank handle yanked before Grohl finished the mini-set with his own solo rendition of “Everlong” in tribute to his missing compadre. John Carter Cash introduced Josh Homme, who looked every inch a David Lynch character and is someone who has always spoken more comfortably through his guitar. He supremely countrified “Rusty Cage” in tribute to both Cornell and Johnny Cash (who had covered it years back so memorably), delivering it like a low-light cocktail lounge vibe whilst wonderfully weaving some Black Sabbath “Hand of Doom” in. Adam Levine, Jesse Carmichael (both of Maroon 5), and Stone Gossard brought it to an acoustic place once more with “Seasons,” honoring the more mysterious Zeppy-tinged Cornell, before one of the more intriguing invitees, Miley Cyrus, strode up in a shimmering purple sparkle dress and long blonde hair. She absolutely owned “Two Drink Minimum,” carrying a melancholy mood befitting all Cornell looked to express in the song. If you weren’t there you won’t get it. Cyrus’ voice bristled with an urge and passion that saw her both deliver the goods and surprise a few skeptics, something I sense she’d have greatly enjoyed doing. And then think about THIS! Geezer Butler with Juliette Lewis on vocals! She obviously knows how to rock a stage, bouncing and strutting old school style all over the stage, while Geezer was both rock and THE rock, a mighty rhythmic anchor alongside the horrifically underrated Brad Wilk. At one point, as Tom Morello spoke about dealing with the loss of his friend and collaborator, he referred to Cornell’s demons as being ridden like a “Chariot of lighting” in terms of creative energies wrestled from them, before speaking of his influence and gratitude to the man. Brandi Carlile fronted “Like a Stone” before Audioslave bowed out with a stormer, our very own Roberto Trujillo joining Grohl, Morello, and Wilks on “Show Me How to Live,” all gleefully tight, taut, and tense like stressed elastic. They subsequently received a ROUSING reception. Some average looking geezer got up and said “hello” into the mic, and once the audience realized it was Brad Pitt, they went potty (Leonardo DiCaprio, Christian Bale, Tom Hanks, and Courtney Cox were among other stars spotted through the night). He introduced Toni Cornell, Chris’ younger daughter, who duetted with Ziggy Marley to bring a moment of beautiful solemnness to the evening, singing Bob’s “Redemption Song.” Kids who lost legendary fathers honoring them proudly and reclaiming some positivity out of such sad situations. The eagerly heathenistic Jack Black spoke next of Cornell’s voice opening portals with notes that didn’t exist, and after a few impersonations, plus an impromptu jam of “One” with James Hetfield as Metallica walked on (James had a full-on blast rescuing Black from the empty stage by the way! ), Metallica settled in to throw down hard. They immediately went “deep cut” with Soundgarden’s “All Your Lies,” ‘Tallica turning the grungy riffs into crowbars suited for their handling before heading straight into a double-punch of “Bellz” and a ripping “Master…” which received the sold-out Forum’s full roar approval. They concluded their four-song set with “Head Injury,” played for probably only the eighth time total (including rehearsals the previous day) but feeling like a direct cousin of the ‘Tallica tune stable; another deep cut designed to bludgeon. And with that, James very quietly, reverentially it felt, said thanks and Metallica left the stage. Another mighty thespian, Josh Brolin, brought out Vicky Cornell so as she could share her thoughts and sentiments with everyone, then came a short set from Ryan Adams. Adams channeled some deep melancholy on “Dead Wishes” and an even deeper “Fell on Black Days,” utilizing violinists, a cellist, a viola, and Don Was in stand-up bass for the evening’s most somber moment. Next Jeff Ament and Fiona Apple did “All Night Thing” before Stone Gossard spoke with eloquence and emotion about Cornell. He referred to him as a “bluesman” whose work “vibrated” through many. Temple of the Dog was formed by Cornell after Andy Wood (Mother Love Bone and Malfunkshun) died, and Gossard spoke of the healing that came through the band’s formation. He addressed a huge part of the evening’s purpose, speaking of how everyone is still grieving and dealing with all sorts of feelings and emotions, and he spoke of the concert as being a step in the right direction, before mentioning Susan Silver, Chris’ first wife and a major force behind so much of what made the Seattle music scene so strong. It was a wonderful, heartfelt, and eloquent speech which you should ferret for on the internet. Lily Cornell, Chris’ older daughter, spoke about her father loving what he did, before vocalist Miguel delivered one of the standout performances of the night, slipping sooo comfortably into the creepy, windy, northwest crawly “Reach Down” against a foggy forest backdrop bathed in blood red mystery. Miley Cyrus returned to front up “Say Hello 2 Heaven,” her voice rich and lustrous, irrepressible once again. With Cornell’s son Christopher quietly introducing them, Soundgarden stepped out, and everyone wondered who could do that mic proud… Well, Taylor Momsen was the woman who took that bull by the horns, turned it into an Arabian racehorse, and rode into the orange sunset. Good-GOD she was excellent, stalking and prowling with insanely comfortable presence, a spellbinding “Rusty Cage,” a whiskey-spiked vibe on “Drawing Flies,” and a belief-beggaring “Loud Love” with Wayne Kramer (MC5) and Morello jamming and leaving me in no doubt whatsoever that should they ever decide to play a few shows again, Momsen would get my vote as Soundgarden’s muse. “I Awake” was blessed by the return of Buzzo’s glorious filth, which is heavier than a nation of large industrial spanners dropped off a cliff onto your head, and with Taylor Hawkins taking on frontperson duties, he fizzily roared and rocked his way through proceedings, laughing that he couldn’t sing “The Day I Tried To Live” giving it a whirl anyway, his enthusiasm and presence making up for anything lost in the larynx. The show finally wrapped up with “Black Hole Sun” featuring Peter Frampton and Brandi Carlile. I felt as though this was a huge and necessary vent for Matt Cameron, Kim Thayil, and Ben Shepherd. Who knows if it will mean anything more than the catharsis the moment brought? And if that is the most it ever means, that is more than could ever have been expected. We should all be grateful – us as fans and observers, them as the creators – that three-fourths of Soundgarden brought it to the big stage again… because as his guitar was turned on and turned up for maximum feedback opportunity, it was clear that one person had been missing for the entire night. His face had loomed large behind every performer, and his presence possibly more so. 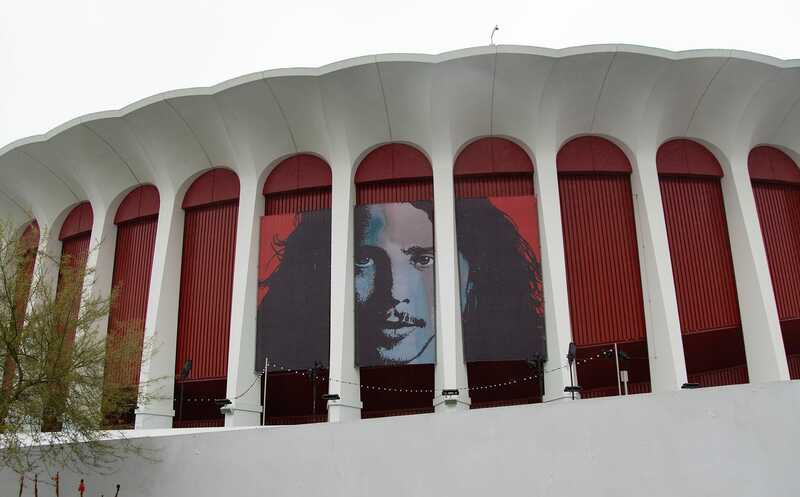 But what I Am the Highway: A Tribute to Chris Cornell overwhelmingly did, was commence a universal healing process, striding into a future which can start to comfortably honor and celebrate the incalculable legacy of Chris Cornell. This is without question going to go down as one of THE live events of the year. And I suspect that even though the fanfare might not have been his brew, Chris Cornell would’ve been delighted at the happiness the evening brought to so many people. P.S. – There are not enough words (because I used a good 1900 of the bastards above!) to acknowledge the might and speedy efficiency of the various road crews who pulled together to make this crazy jigsaw work and work so goddamn well. Never take them for granted people. Never.